The first part of this post is the important part if you want to know how to avoid GMOs. 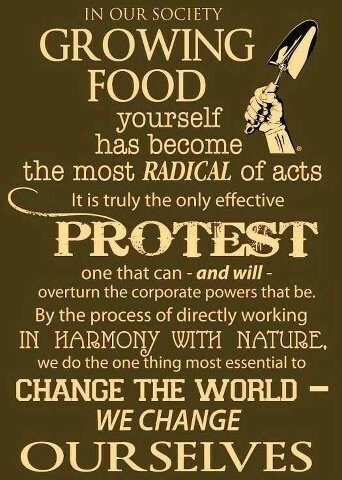 The second part is important part if you want to save the world from GMOs. But if you want the super short version, the picture says it all. Grow your own food even if you can only manage a tiny amount. Look for heirloom seeds, hybrids if you must comprise. Gardening, waiting may be less convenient than just going to the store whenever you need something, but it’s the only way you’ll know for sure what you’re eating. The problem with GMOs is enough to cause insanity, but I take comfort in knowing that there is something I can do about it, something we can all do about it. Immediately after this comfort I am depressed by the knowledge of how many people are not doing any of these, but then I remind myself that it all starts with the choice of the individual. I am an individual and so are you and we have a choice. (1) There are two labels that you want to watch out for. USDA (or other agency) certified organic doesn’t ensure much, but it does tell you that you’re looking at something that shouldn’t, at the very least, have GMOs in it. The None GMO Verified seal from the non-GMO project, a non-government group that inspects foods from provider members. View the seal here (http://www.nongmoshoppingguide.com/non-gmo-project-seal.html). (2) Almost all corn, and soy crops in the USA and Canada are genetically modified. A lot of cotton is and canola is genetically modified. Avoid those cotton seed and canola oils. Beet sugar can come from genetically modified beets. Unless you’re getting it from an absolutely reliable source then avoid these crops at all costs. Corn and soy is, in some form or another, present in virtually all processed foods. Unless it’s certified organic or a fruit or vegetable, it probably has GMOs in it. I got in an interesting debate with a couple of people over an article about whether our food should be GMO labeled. The first guy said started by saying that labeling would raise food prices. I can’t find the article, so I can only tell you the general outline of our conversation. A lady jumped in and said there was nothing wrong with processed foods and she said something about it being the food she trusted to feed her family. I almost vomited then, but I tried to explain what ‘real food’ was and that it was not the twinkies, chips or anything else that has all the nutrients processed out of it like the fast meals that only have to be stuck in the microwave. Just because it’s edible doesn’t mean you should eat it. Well first I’ll say that it’s not a snap your finger and it’s done answer. There are many things that have to change if we are to have a sustainable way of feeding people. GMOs are a short term answer for a long term problem. Because there are many things that have to change in our food system, I don’t have all the answers and they won’t be as in depth as they need to be because I’d need a novel in order to cover it all. Second, my answers aren’t something I can do by myself. It can only work if people are willing to work together. Third, it is my personal belief that the Earth doesn’t belong to us. Us as in people, as in people currently living on the planet and us as in humans in general. We’re sharing it with animals, insects, plants, everything else (which no matter how much we modify food we can’t live without. Our success depends on theirs so we should try harder to keep them around) and we’re borrowing it from the generations that are coming after us. People think that they can live whatever kind of life they want and never have any consequences and that just isn’t the case. Nature is not the problem. Humans are the problem. That being said there are a couple of major problems. Overpopulation is a problem. At some point it will be impossible to feed everyone. If we don’t run out of food then we’ll run out of clean water and air. We need to realize that and the sooner the better. Another problem is the meat industry. Cows were meant to eat grass and only grass despite what those big corporations tell you about their healthy diet of corn, soy and whatever else. Over 70 percent of the corn we use today is fed to cows. The other 30 percent is fed to humans, pigs and poultry. If we went back to feeding cows grass then it would free up the space of the corn that we’re feeding them and also the space of feedlot. Not only that, but we wouldn’t be polluting the water with our huge amounts of cow crap. Cow dung is actually supposed to help fertilize soil. The way our system is set up with cows here and crops over here and more specifically that most farmers grow corn and only corn is that the soil isn’t being fertilized properly. Chemical fertilizers aren’t fixing that and can’t fix it. If there are no nutrients in the soil then we can’t grow anything. GMOs won’t fix this. They aren’t just growing extra corn to feed corn, but they’re putting it in gas. Is that something people should do if the world was starving? We are actually overproducing food. The world produces enough grain to feed every person at least 3,500 calories a day. http://iml.jou.ufl.edu/projects/spring01/denlinger/problems.html Some say more than 40 percent of food produced in America isn’t eaten, which makes that about 29 million tons of food waste and that they say can fill the Rose Bowl every three days. Food scraps make up 17 percent of our waste in landfills. It seems to me that if we really cared about those hungry people we would at least stop taking more than our fair share and throwing it away. Once I read an article that said a quarter of the food sent to Africa was wasted because it went bad before it even got there. The problem isn’t growing the stuff; it’s getting it to its destination. That’s my first suggestion. Stop wasting. My next would be to start growing our own food. Everyone can grow something even if it’s having a cherry tomato plant or a blueberry bush, every little bit helps keep pressure off the food system, which means they don’t have to take such drastic measures to feed everyone. Also supporting local farmers help. This doesn’t help people in Africa where it’s dry and nearly impossible to grow things, but what we don’t use can be sent to help them. I have read several articles that claim and have proof of the idea that medium sized organic and non-organic farms are the answer. They can produce more than the giant corporations who are responsible for the all the processed foods. Because I’m no expert and I wrote this late, late last night so I’m sure it’s poorly written at best I’m going to suggest a couple of things. Fast Food Nation by Eric Schlosser. I’ve heard really good things about it. It should show just what these corporations that you’re trusting to feed your children will do in order to take your next dollar. There is a movie, but it’s horrible and does nothing to explain anything so don’t watch it. Folks, this ain’t normal by Joel Salatin. This book does a good job explaining what is wrong with the current food system. Food, Inc. is a movie. If nothing else watch this movie. It will change the whole way that you see food and it’s only a couple of hours as opposed to a whole book. The lady had nothing to say after this. That left me with only one person to worry about, but interestingly enough just happened to work in the meat industry. He, of course, said what I said about the meat industry wasn’t true. Some of those people who work in the meat industry think they’re saints. Trying to argue with that wouldn’t have done any good, so I moved onto his next point, which was if the food were rotting before they got to the recipients, what could be better than growing the food where the recipients are? It’s a good point, but if GMOs are going to kill them anyway then what’s the point of that? Also, road infrastructure isn’t like it is here where we have roads to take you where you want to go. Harvesting and transporting would still be a problem. I’m sure we could still be discussing the subject now, but I said that we may have to agree to disagree and gave my last response. I don’t let things go, so as long as someone says something then I’ll say something back. Luckily, this guy was the bigger person and he let us go. So how can we make our oceans a bit cleaner? 6. Don’t litter- trash gets blown in the wind. It’s more likely that it’ll find it’s way to water that covers 70 percent of our earth than to just happen to land in the landfill or even less likely, the trash. If you find litter pick it up and recycle if you can. Click here for more solutions to reduce your use of plastic. Did you know that there are actually alternatives to animal testing? Yep. There are alternatives to the pain and suffering of millions of animals, but…..we’re not using them. Most of these replacements involve things that I don’t agree with. Most of them involve creating cells in a petri dish. I would be lying if I said my respect for humanity didn’t dwindle with just about every word that I read these days, but, for me, being able to grow life in a petri dish reinforces that idea. The creation of life isn’t anything short of a miracle and that’s something that we still had going for us, but science has made sure that we don’t even have that. One way to replace animal use is to improve the use of information. This means that by using epidemiological studies and similar information, it may be possible to avoid animal testing in some instances. Using previously established information means that researchers can avoid repeating experiments. Also, mathematical and computer models can sometimes provide information that is sufficient enough to warrant avoidance of animal testing. Another replacement method is to use plants and microbes instead of animals. As mentioned, in vitro methods can sometimes replace animal testing as well although they are more commonly used to reduce the number of animals used rather than as a total replacement for animal use. Human studies can sometimes completely substitute animal use in an experiment. In particular, human studies have replaced animal testing for cosmetics development. In my opinion this should the first option. If we’re the ones who need it then we can be the ones it’s tested on. Scientists are growing skin in the lab to test the effects of chemicals on skin. This still isn’t good enough for scientists because they have to see the effect of said chemical and diseases on a complete working system. Epidemiological studies, also known as population studies, look at the link between someone’s lifestyle – including factors such as diet, habits, and occupation – and disease. These studies help researchers connect cause-and-effect relationships between lifestyle and disease without doing specific testing, and can help scientists gain an understanding of diseases to help decrease the use of animals. Computer models can be used to simulate diseases and to help scientists understand the way different substances can be used to treat disease. The models are based on existing information and data and can help researchers with information specifically relating to humans. Cell and Tissue Culture (In Vitro Testing): Samples of human cells and tissues can be used in laboratories to test a substance in a certain type of cell or tissue. It is relatively low-cost and is beneficial because it provides researchers with information specifically relating to humans. Cell and tissue cultures are grown outside of the living organism, creating an artificial environment for toxicology testing. However, using cell and tissue cultures does not allow a researcher to see the effect of a substance in a living body with all its complexities. This method is valuable for research and can help limit the use of animals, but can’t replace them entirely. In an article written in 2008, the EPA, the National Toxicology Program, and the National Institutes of Health are trying to come up with new technologies that will result in the end of animal testing in the next 10 years. That was then. They have 6 more years left. This what science is doing to help the problem, but what can we do? Most animals are used for medical research. Contact medical schools to ask what their policies are for research. If it something that is on a level that you disagree with like live animal dissection, then ask them to stop and tell your reasons why. Along with that is a need to live a healthier lifestyle. By eating and living healthy, you can avoid taking the medications that are tested on animals. Some complications can’t be totally avoided, but some could be with a healthier diet. Cutting out processed foods completely is the best way to do this. Click here or here to find out why. Some of the companies that make the food that we eat everyday have even been tested on animals. Let’s back up and look at that statement. They are putting stuff in our food and their not even sure if it’s safe or not? Yep, you read that right. And that is why people shouldn’t eat processed foods. There is another option, but it comes with somewhat of a dilemma. Cruelty-free labeled products. It would be nice to believe it’s a black and white decision, but the simple fact is that people are full of lies. It’s a marketing ploy in a sense that they are willing to prey on poor people like you and I that want nothing more than to believe that we’re doing the right thing. Sometimes people are so relieved they just don’t bother to second guess. Luckily, I didn’t have to wander very much further before I found a rare honest soul out there to burst my bubble. There are two situations in which this works. One, the ingredients have just been tested before on other animals. The particular company in question just uses previously acquired research for their information. To me, this is the most I could hope for from these people. I don’t think this is an entirely bad deal. I wish more companies would do this if they’re going to put poisons and toxins into their products. Do I wish that no animals were tested? Yes. But if they ‘must’ then having a company that used information from a test that was already done instead of doing a test again is a better deal. Another issue is that sometimes a company tests individual ingredients and label ‘finished product not tested on animals.’ No government agency is in charge of making an official definition for these terms. Another way they can get around it is by selling their products in China. China doesn’t have animal testing regulations. Actually, the China government reserves the rights to do their own animal tests. I think what peeves me the most, besides all the lying companies of course, is that most products out there cause health problems like cancer anyway. Why even bother to test it if you’re going to sell it no matter what the repercussions are? So how do we know what we’re buying is the best that we can get? Well to be honest you can’t. You can’t trust labels, you can’t trust the companies, and you can’t trust the government. Who else is there? PETA is known to have a fairly good list, but it is also known to have companies that do test on their do-not test list. From what I’ve read, the Leaping Bunny is probably your best bet. It has a Corporate Standard of Compassion which requires a written statement from the company and its ingredient suppliers stating that it hasn’t used animal testing. As far as I can tell, there are no surprise visits or visits at all of these companies as part of this process, but you can sometimes double check against news related articles. The last problem that, at least I have had, is that most of the cruelty free products that I can find are from really small companies and I can’t find any background information for their environmental accountability. Any that I could find information for was a bit disheartening for me because they’re ratings were extremely low in the environmental and even human safety ratings. The bottom line is that probably the most important thing you can do is educate yourself on companies that use animal testing and ones that don’t. Stop buying from the companies that do support and participate in animal testing. Write them letters telling them of reason for no longer supporting their products and to ask them to stop. Remind them who their selling to. Switch to buying products from a cruelty free company and write them a letter thanking them for their promise to be cruelty free. We’ve all been informed on the high prices of factory farming. The information that I presented is not everything you can learn about animal cruelty on a factory farm. There is fish, turkey, duck, bees and various other animals that still have voices that should be heard. I have barely scratched the surface of this problem. This information has different effects on different people. Depending on what taste has been left in your mouth, you may be willing to take more drastic measures than some. Today I’m going to give you your options. You could become a vegan. For most, this is the most drastic lifestyle change you can make. It requires giving up all animal products. You should definitely research this in greater detail in regards to nutrition and what exactly you have to give up. Below is a list of a couple of sites that I found that seem to have some good information to help you get started, but there are tons of others that will help you, in a step by step fashion, become vegan. Vegan may not be the right choice for you at this point or for me. I know that where I live doesn’t even have vegetarian options, let alone vegan, so if you can’t quite make it to vegan, you could always try vegetarian. You should also really look into nutritional facts before trying either of these diets. I’ve said this before, but I’ll say it again. My issue is not eating meat as a whole. It’s not necessary, it’s not natural and vegetables are better for the environment as a whole and I could argue about it until I’m blue, but arguing with people is pointless and it’s really not my main concern to get people to stop eating meat altogether. So for those who are refusing to give up meat altogether, I have another proposition for you. Open your mind for just a minute, a fraction a second, a teensy tinsy fraction of a second. What if you just ate less? What if you gave it up for one meal or ate half the portion that you usually do? Or if you’re feeling good, maybe gave vegetarianism a trial run for a day, maybe two or maybe even a whole week. I’ll admit that before I watched Food, Inc. that was not happening. I didn’t even want to consider it. I ‘loved’ meat and there was another factor, too. I always felt like I was starving if I didn’t eat it. Two things happened when I watched Food, Inc. I immediately wanted to stop eating meat, but I knew that I had to replace it with something. Something that I really didn’t like at all and that was…vegetables. A couple of months before that I realized how tired I was eating meat and potatoes all the time, so I ventured out and tried…a cucumber. It wasn’t as bad as I remember it being when I was a kid. That gave me some confidence to try an avocado, which wasn’t as bad either. And that got the ball rolling, so when I watched Food, Inc. I was already half the way there because I knew I would have something to replace meat with. I still don’t like vegetables all that much, but it’s worth it to me. My mom had also been cutting back our meat consumption a little a time because we wanted a healthier diet. After the movie, she cut back a little more and the craziest thing happened. I wasn’t as hungry when I ate less meat or no meat at all. Before I had been lacking nutrients in my meat and potato diet which was the reason I always felt like my stomach was eating itself. She also started looking for less cruel places to get our meat. A little at a time, we started to replace factory farm meat with local farm meat from places that at least gave the animals a good life. This is your fourth option. To find a good local farmer that you can trust or know. That’s the best you can do if you’re not willing to give some up. Here is a great, great, great article about that. It even breaks down what the labels mean. According to this article, the worst places that you can buy from is Buckeye, Cargill, which is the largest corporation in the U.S. and if I remember correctly it’s the largest meat producer in the world, ConAgra, the second largest food company in the US, DeCoster, the nations’s fourth largest egg producer and on and on I could go. Tyson is also in this article and that’s the big one I’ve always heard about in terms of animal cruelty. Of those videos I posted, most came from Tyson. This pdf is 23 pages long, but if you care anything about the environment, yourself, animals, about anything at all, you need to read this. It will give a list of people not to buy from and why. Most of it air and water violations, serious ones, but there are some animal right and cruelty violations. There more than what is on this list and that is why I suggest buying from a local farmer. This pdf also has links to sites with maps of local farms and co-ops. I’ve read several times, that if you just make one healthy change then it kind of makes your body start to crave healthier things. When I stopped eating so much meat, I actually didn’t want as much sugar. Sugar had been kind of like an addiction for me. I really felt like I needed it, but the more vegetables and less meat I ate, the easier it was for me to control. Part of the reason was because I was craving meat so bad, but that phase is over and I still don’t feel quite the strong pull that I did before. Try to keep this mind when you’re thinking that you could never give up meat. Just give the idea a chance. If it doesn’t work then just do the best you can with any of the suggestions I’ve made. Tell everyone you know or who will listen. Show them. Sometimes it takes seeing things before they actually register. Don’t bully because that can turn people off. Sign a petition. Change.org has tons of petitions. Just type in animal cruelty, animal rights or factory farms and sign away or start your own. They have a list of victories, but I honestly don’t know how much these petitions help. As far as people in charge of policies and who can make the biggest changes, here is a list for that. Congress is another group that you want to talk to. It’s hard to tell whether they are even listening to us anymore, but they should because being elected seems to be what is most important to them. Here is a great site that gives information by state on how to get in your touch with your legislatures. And lastly, go to the source. The people that I mentioned above and anyone in the pdf could use a little humbling. They’ll deny that they had anything to do with anything and your letter will probably never even be looked at by someone in charge, but go for it. Just go for it. There is also any number of organizations like the Humane Society, Mercy for Animals even PETA to donate to. And by the way, while I was looking information, I found out that the people who are taping these videos could be charged with terrorism. Making these videos was already considered illegal, but they are so determined to hide this ugly truth that they are willing try to count it as an act of terrorism. Who can we thank for this? Lobbyists. Corporations spend thousands to millions of dollars to make sure that their agenda is pushed in congress. We will have to start screaming at the top of our lungs if we don’t want our voices drowned out by money. Wood, grass and food scraps undergo a process known as biodegradation when they’re buried. They’re transformed by bacteria in the soil into other useful compounds. This doesn’t work with plastic and that’s why it’s not unreasonable to believe that plastic will never biodegrade. To decompose, plastic needs sunlight. This is called photodegradation and happens because UV rays strike plastic and then it breaks the bonds holding the long molecular chain together. Over time this will turn a big piece of plastic into lots of little pieces. Research says it could take up to or more than a million years for this to happen. This is a problem because most plastic never gets to see the light of day. Landfills are usually set up as one of two ways. Either the landfill is set up where trash is buried or where trash is piled up like a mountain. Then there is the plastic that ends up in the ocean or another body of water. It gets all of the sunlight that it needs to break down and it can break down in as fast as a year, but the problem now is those little bits of plastic are toxic chemicals such as bisphenol A and PS oligomer. Biodegradable plastics are somewhat better, but not really. There are two kinds, Polylactic Acid and Oxo-degradable plastic. PLA is made from plant sugars. It does not use oil and it breaks down into water and carbon dioxide when exposed to bacteria. The good thing about this plastic is that it doesn’t use fossil fuels (plastic already takes up 200,000 barrels of oil a day in the United States) and it uses 65 percent less energy than producing regular plastic. The bad news is that it takes a controlled environment. Unless all oxygen is removed and temperatures reach at least 140 degrees for 10 consecutive days then the bacteria can’t do their work. In these conditions it will take as little as 90 days to decompose, but these are unrealistic expectations for lives in landfills. The plastic bags will stay around just as long as the other kind. The last problem is that they can’t be recycled. Oxo-degradable plastics are by products of oil. They decompose in oxygen rich environments such as large industrial composting tanks, but not landfills. Although it would not be unreasonable to say that totally ridding one’s life of plastic is impossible, there are some things that people can do to reduce their plastic use. Try to reduce the number of things that you buy that are packaged in plastic. By a water filter instead of buy bottled water or use a reusable water bottle that you can reuse instead of a one use only bottle. This goes for many other things. Next time you go shopping look at the other options you have in that aisle. Buy trash bags, detergent, bar soap, cereal, that come in boxes instead of another bag. Also check to see, usually on the bottom, what kind of plastic it is because you might be able to recycle. 1 and 2 plastics are the most likely plastics to be received by recycling centers. Use reusable bags when you go shopping. At our house we have a trashcan under the sink that is the perfect size for grocery store type plastic bags, but if you don’t have that option bring cloth bags with you to the store or reuse the same plastic bag multiple times. Also, if it’s an option, you can ask for paper instead of plastic. Use old/used paper or newspaper as packing for mailing packages instead of bubble wrap, air filled plastic or packing peanuts. Use real dishes instead of plastic dishes. Make compost for your scraps of food and after it decomposes put it back into the earth. This is great fertilizer for gardens, but you don’t need a garden to have a compost bin. Since my mom has started her compost we have cut our need for trash bags by almost half. That’s pretty good.